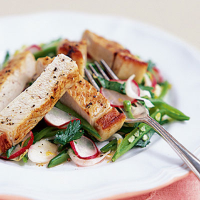 This crisp, oriental-style salad of radishes, sugar snap peas and chicory goes brilliantly with slices of garlicky pork loin steaks. Peel the garlic clove and cut it in half. Rub the cut side all over the pork steaks and season them with freshly ground black pepper. Preheat the grill to its highest setting. Place the pork steaks on a grill rack and cook for 4-5 minutes each side, or until cooked through. Place on a plate and keep warm. Finely slice the radishes and cut the sugar snap peas into matchstick-sized strips. Place in a bowl with the finely shredded chicory and chopped coriander. Mix the sesame oil, lemon zest and juice, and honey together and season. Drizzle over the salad. Divide the salad between 2 serving plates and top each with a pork steak cut into thick slices. Try cooking the pork on the barbecue. Serve with the salad stuffed into picnic pittas.